Do you have a bump in your ear? What causes them? They can form in any part of the ear, but they’re often more painful and obstructive when they are inside the ear, rather than on the outside. A bump in the ear may be a painful, but may clear all on its own. Bumps inside the ear can be zits or sebaceous cysts. Those are a conglomeration of skin oils and dead cells. Benign (non-cancerous) osteomas are bony growths inside your ear, which may cause hard bumps. Otitis externa is an infection in the ear canal, and it can lead to swelling in the ear. Cancer in earwax cells may cause bumps. They are more commonly found on the exterior of the ear, but some occur within it. If you have any suspicions about a bump, contact your physician right away. Ear infections can cause zits, pimples, scabs and bumps in your ears. If you have a bump in your ear that is painful, it’s usually a pimple. If your pain is acute, contact your physician immediately. While smaller bumps may clear up without treatment, big bumps in your ear lobe may be symptomatic of another source. Most times, if you have an earlobe piercing, you may develop lumps, called keloids. They are hard to get rid of, and surgery is sometimes used for this purpose. 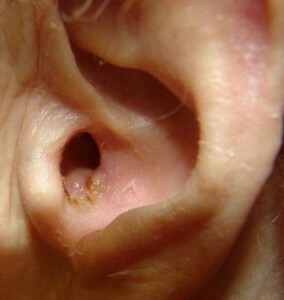 Lesions and keloids may appear as bumps in the ear. Irritated bumps can cause discomfort because there is limited space inside. They sometimes occur next to any ear piercings you may have. Oil from the skin, debris and buildup may cause these bumps. Sometimes an ear bump can begin to produce a discharge. It may be from fluid, pus, wax or blood. This occurs mainly when people try to pop their bumps before they are ready to be popped. A ruptured eardrum may cause an ear discharge, usually yellow or bloody. Irritations like eczema may also cause bleeding from inside your ear. If you pop an ear pimple, it will cause pain and discharge. In order to prevent ear pimples and bumps from bleeding, be sure that you don’t use any objects or your fingernail inside your ear until the painful lumps have healed. Bacterial infections that are only mild may form bumps that can bleed. Acne spots may also bleed if they are popped or scratched. Don’t pick boils, lumps or pimples in your ear, since this will likely make them bleed. Any drainage from the ear canal could be alarming. Pus from swollen bumps inside the canal may signify a serious infection in the ear, or of open sores in the ear. Open sores on ear bumps may be signs of cancer, according to LiveStrong. 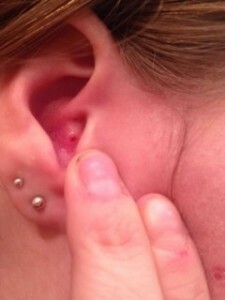 Seek immediate medical attention if you feel swelling or see pus from your ear. Cancer is best treated in its early stages, but it may very well not be cancer. If it is, the treatment most often used is removal of part of the outside ear, according to the Merck Manual. If you have a pimple on the earlobe behind your ear, it is probably a cartilage lump. If it is on the head or scalp, it is more likely a pimple or scalp bump. Hard, large lumps at the back of your ear may be caused by infections like sebaceous cysts, cancer, otitis media, lipoma, mastoiditis or lymphadenopathy. If you find a pimple behind your ear, allow it to ripen before you pop it. Even then, only do it if you have experience popping zits. If it grows larger or becomes more swollen, inflamed and painful, see an Ear, Nose & Throat (ENT) specialist to have it diagnosed and treated. The pressure exerted on your head from your pillow every night may be enough to result in painful bumps on the cartilage of your ear. A lump inside the top ear cartilage is almost always just a benign lump. DermNetNZ reports that a painful pimple on the ear cartilage usually occurs in those who mainly sleep on one side at night. Minor trauma may precipitate the problem, including exposure to extreme cold or tight earbuds or headsets. 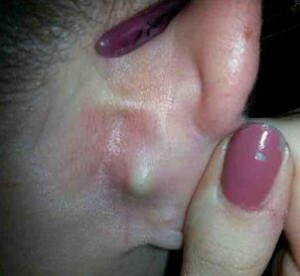 These cysts occur on the ear cartilage and they form on top of and inside the ear, as a rule. They begin as pimples, but if you pop them, nothing will come out. These cysts may be painless or painful. When developing, they may turn into formations that look like blisters. When hard, they may appear similar to moles. This condition usually affects the ear’s inner rim. Its medical name is chondrodermatitis nodularis chronica antehelicis. Physicians report that this disease could last for a period of months or even years. It is commonly confused with cancer in the ear. Malignant (cancerous) and benign tumors may cause lumps in your ears. They include fibroma, melanoma and lymphoma. Skin moles are also a type of tumor that can cause the bumps. These are only cancerous in some cases, but in those cases, they need immediate treatment. Your physician will usually take a biopsy of the lump, to help him in diagnosing the condition. Ear piercings commonly develop keloids. When a piercing is done, it leaves behind a scar. 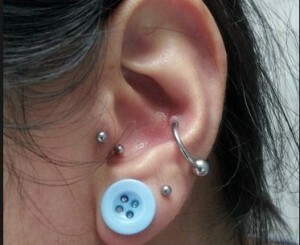 It extends beyond the piercing hole as the area heals. Lumps or bumps, usually large, are often keloids. Keloid treatment includes surgical excision and steroid injections. The injections reduce the pain and inflammation, and excision removes the tissue growing externally. Be aware that keloids can recur, even after they are treated, according to Tampa Facial Plastic Surgeon Edward Farrior, MD. This is fairly common, and it can be painful, especially in its early stages. It may cause ear pain and headaches, particularly when you move your head or talk. Small, painful lumps on your ear cartilage may be brought about by cystic acne. Infected pores in your ear become blocked, and can develop easily into painful pimples. These are also more common if you have piercings on the ear. Bhupinder Kaur, MD on MedHelp, reports that if the bumps cause cosmetic issues, you can have them excised by a dermatologist. Some people believe that listening to music in headphones, and just wearing headphones or earbuds, can cause bumps in your ear. There is some science to support the headphone or earbud bumps, and the loud music or noise can cause hearing problems. If you have itchy skin after wearing earbuds or headphones, be sure they’re not rubbing your skin. Infection could occur in the ears if your ear buds aren’t clean. Don’t share your headphones or earbuds with anyone else. In addition, regularly clean your ears to avoid wax accumulation. Cleaning your ears regularly helps in pimple prevention. If a bump in your ear is cystic acne or a pimple, give it time to heal on its own. Cleaning your ears carefully will usually be enough to heal the pimples and prevent formation of newer pimples from a buildup of ear wax or shampoo. Avoid popping smaller pimples and bumps in the ear. They are painful and may bleed a lot if you squeeze them. WikiHow.com recommends a dabbing of saltwater and tea tree oil on the pimple. This reduces swelling and helps them to heal more naturally. Infections that occur on the earlobe and outer ear may be treated with oral antibiotics. These are effective mainly for smaller lumps like small swellings and acne pimples. Your general physician or dermatologist can diagnose the cause of the bumps in your ears, and prescribe a proper antibiotic to heal them. You may be prescribed corticosteroid ear drops to help in the reduction of swelling. Some ear cysts may need injections of corticosteroids to reduce their size. Other useful treatments include excisions and drainage, according to the Mayo Clinic. Keloids are generally removed from the ear through surgery if they obstruct hearing or create aesthetic problems. Removing lumps, growths and cysts surgically may not be as effective if any of them are actually keloids. They often recur, and are even larger then. This VIDEO shows the process of popping an ear pimple.